For most Americans the traditions are still in place for the celebration of the Thanksgiving holiday. Families are gathering (if they can afford the trip or brave the weather) for a turkey dinner, rich salads, mashed potatoes and pumpkin pie while the television covers Macy’s spectacular Thanksgiving Parade followed by an afternoon and evening of football. Of course the parade has long signaled the kick-off of the Christmas shopping season, but behold, the Christmas campaign started again this year on Halloween and a lot of the big stores have their doors open and are promoting super sales again on Thanksgiving Day in an effort to lure people away from the dinner table. The turkey, the stuffing, the potatoes and other vegetables on the table aren’t quite as wholesome as they once were. Most are packed with genetically modified foods laced with weed killer, insecticides and chemicals that make the turkeys grow bigger and fatter in less time, all in the name of big corporate profits. The televised parade and football games are packed with ads designed to try to draw us to the stores to shop. Thus it is that the Norman Rockwell artistic vision of Americans reflecting on the blessings of a plentiful harvest and a productive year have been stolen. It has been turned into a holiday that is so packed with big corporate commercialism that our brains are filled . . . at least subconsciously . . . with desire for more things than we already have. And if we aren’t careful, and submit to the call to rush to the store and whip out those already nearly maxed credit cards to buy more stuff, many of us will be lining up in bankruptcy court in 2017. That is if we can afford the legal fees and are willing to wade through all of the paperwork required. Thanks to the crooks that now control Washington and many of our state governments, a lot of people in America will be going hungry, or lining up at church and community sponsored holiday dinners for the poor and homeless. And that is if they are lucky. 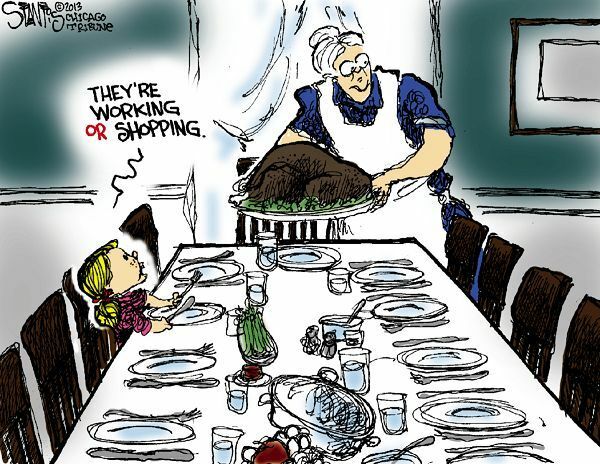 But if they get a meal on Thanksgiving Day, it will be something to be thankful for. This writer is among the retired who are living on Social Security. This is the program that the Republicans threaten to take away from us, or at least cut back on cost of living adjustments that used to help us cover our heat, electric, water, food and medical bills. For us, and the millions of unemployed and financially straining Americans, all of the commercialism of the holiday season is falling on deaf ears. Even if they could stir a desire to possess things we don’t already have, we can’t afford it. They are preaching to an empty room.